As part of their learning about the solar system, they engaged in an inquiry activity that asked them to identify each of the locations in the solar system from the video, and demonstrate what the video was showing them in terms of the characteristics of that location. For example, one of the scenes showed people in helmets and spacesuits hiking on mountains with a blue setting sun on the horizon. Through their investigations, they learned that this was Mars, that the atmosphere of Mars is such that people can’t breathe without suits, the sunset colours are different due to the different atmosphere, and that there are amazing locations that humans might want to explore on foot, should we ever get to Mars. This was done collaboratively in small groups using Google Docs. The next step in their solar system exploration was to inquire into different locations in the solar system, understand the properties of that location, and develop an idea for a possible activity or attraction that humans would consider should we ever get to explore that location. This became the seed for our NPDL project. 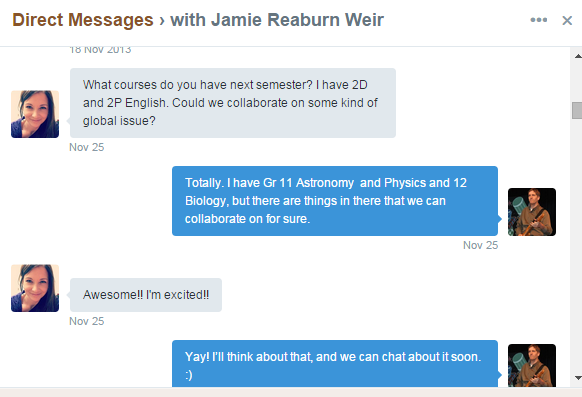 During the development of this idea, I was chatting with another teacher in Waterloo Region DSB, Jamie Reaburn Weir, and we decided that this was an opportunity for our students to collaborate together on a project with the goal of working on collaboration skills both in face to face groups, and in a digital, asynchronous medium. An interesting twist is that Janie is an English teacher, and we had to consider our goals very carefully to meet the needs of the curriculum in both my grade 11 astronomy class, and her grade 10 english class. In the end, as we focussed on the idea of creating a digital product to demonstrate their understanding of the science of the solar system with the goal of persuading others that this was a great idea worth doing. The concept of persuading people, pitching an idea and using appropriate methods to do so was a great cross-curricular tie in.